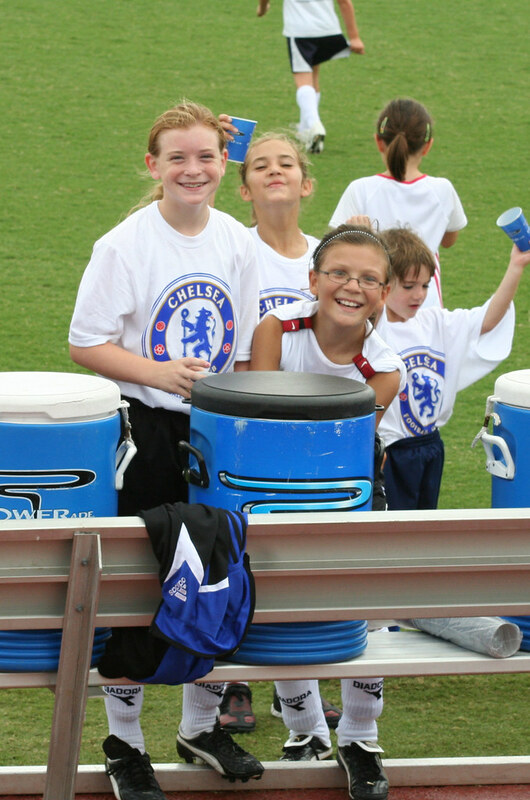 Logan, with her teammates Emma and Stephanie, at SMU for a clinic with Chelsea FC!! The local news did a story about this as well, and there is a nice shot of Logan on video. So far I have not been able to find that clip on the web, although its on my Tivo. More transition this week, trying to get some running done in the morning. However, the runs were not very fast or inspired. I took Friday off of work and so I ran a bit later and had something to eat beforehand which seemed to help. For the weekend Marissa and Logan played in the Puma Cup Soccer tournament Friday through Sunday. Marissa had three games and Logan had four games (including a semifinals appearance that went into two overtime periods.) Because of the Friday games, I was able to get out on the bike with Terry on Saturday. But then we had four soccer games in the heat and I was exhausted Sunday morning - so I only did a short run. I decided that I need to start back to strength training so next week I am going to start circuits. Monday July 13: 30 min Breck; 4 miles run. Wednesday July 15: 66 min run from carrington 7.9 mile run. Friday July 17: 65 min run from carrington 8.3 mile run. Sunday July 19: 35 min run. 4 miles. Wow. June was a tough month. Lots of stress and drama at work. Logan and Marissa spent the month trying to figure out which select soccer teams that they would commit to for the next year. A trip to London. That resulted in my first rest day since February. Two weeks with zero bike miles during the month which was a bit disconcerting given the impending STH-100. I ran a bunch of 800s and 1500s. The 1500s were faster than last year, but the 800s were not. The London trip cut short the last attempts to get down to 2:15 for 800. Oh well! After a ton of soccer over the weekend, we drove down to New Braunsfels for a couple of days of mini vacation before needing to come back for Soccer signing on July 1. Originally I was going to run the last track meet of the season on June 30, but given the trip to New Braunsfels, that plan was nixed. So, that also meant a transition week. My right Achilles had been aching as well, so just as good to take it easy. And I was still really tired from my trip to the UK. Monday and Tuesday in New Braunsfels, I ran short and really easy. Wednesday I thought that I might do a full eight miles, but it was 95 degrees with full sun, at noon when I headed out for my run. So I cut that run short too. Friday was a crazy day at work and in the end I was not able to get anything in. Just as well because Saturday was the Fourth Annual StoopidR than Hell 100. With dead legs from the STH 100, on Saturday Vic dragged me around for 47 more miles of fun on the bike! I had noticed before the STH and before the ride with Vic that the air pressure on my rear tire was really low. After the Saturday ride I discovered that the tube was indeed leaking. Nothing like 150 miles in two days on a soft tire. Sheesh! And then since I had no swimming this week, I hit the pool on Sunday. Monday June 29: 30 min New Braunfels 3.2 miles run. Tuesday June 30: 40 min run New Braunfels 4.2 miles run. Friday July 3: STH 100, Ave 17.4 CAD 75, 5:44 ride time, 100.3 miles bike. Saturday July 4: Ride with Vic to Rockwall - Ave 16.4, CAD 76, 2:53 ride time - 47.5 miles bike. We had a hard time settling on date for the STH 100 this year. In the end I decided that Friday July 3 would be the day. Sadly that date did not work for Mike, or Victoria. Kathy also wanted to join us this year, but she (or her coach) could not cope either. So in the end it was me, Terry, Tim and Super Dave. I pulled out of my house a bit late at 4:50 and met Terry at Renner and North Star. Tim was going to meet us on the route, but Super Dave should have been at Renner and North star with a new buddy he was bringing. As soon as the clock struck 5am, Terry and I decided to leave. We headed up North Star which as everyone knows turns into Los Rios and then just east of Jupiter I saw a flashing headlight which sure enough was Tim. The three of us headed up Jupitar and just before we got to Bethany, Dave came whipping by in the Davemobile. Apparently Dave got pulled over by Richardson's finest on Renner road just before he got to the meeting place. I must have driven by the cop on my bike, but I did not see him. We had a mild south wind. From Allen, Dave Tim and I hammered pretty hard up to Van Alstyne. Terry took it slow and easy. We reloaded water bottles and then headed up to Sherman. In Sherman, we took a slightly different route than last year. Then we hammered it back to Van Alstyne and reloaded the water bottles a second time. We took turns at the front, this time including Terry and made great time to McKinney. By this time it was heating up for sure. But I was in good shape. We reloaded water bottles at the QT one last time and headed home! Dave was dragging a bit by now and Tim too. Heading back we dropped Tim at Greenville and Bethany and then we dropped Dave at his car at Bethany and Jupiter. Terry I headed back down Los Rios and Terry turned at Renner. I went down to Beck, because I figured if I went straight home I would be a bit short. Once home I put down a towel and got an Ice Pack for my head and then I chilled out! Another STH in the bag!! PS: Saturday I went out an did another 50 with Vic. I noticed that the air in my tire was really low - which it had been before the STH. After the Saturday ride I checked the inner tube and sure enough it was leaking. Nothing like 150 miles on a bad tube! Sheesh! London!! Chelsea to be exact. Up early Monday, Tuesday and Wednesday to run in the AM. It was really nice running in the morning which is something that has been difficult with my current job. Also, the temperature was spectacular (compared to Dallas)! Monday I headed down to the Thames, across the Albert Bridge, through Battersea Park, over the Chelsea Bridge and out along grovesner and back. Tuesday I made my way up to Kensington Gardens and Ran the circle including Hyde Park. Wednesday I did the Hyde Park Loop, but I got a bit lost on the way back! The planned 60 min loop turned into 85 minutes!! I realize only now that there is a Sloane Street and a Sloane Ave and I got these roads confused. Looking at the map now, I see that had I gone one more block west on Kings Road, I would have hit Sloane Ave and I would have been back to the hotel MUCH earlier! So that Wednesday run started a 26 hour day. I had gotten up at 0500 for that run. Then I worked until 1:30. Then I caught the tube to Heathrow for a 4pm flight that was delayed by an hour. I got to O'Hare at 7 and then to DFW at 11:30. I was home at 1am (7am London Time). Ouch! Thursday I did an easy run in the evening for recovery. Friday I got in the pool. Saturday I rode with Terry and Sunday I rode with Victoria! Monday June 22: 60 min run on Thames. 6.7 miles run. Tuesday June 23: 63 min run in Hyde Park/Kensington Gardens 7.2 miles run. Wednesday June 24: 86 min run in Hyde Park/Kensington Gardens 9.5 miles run. Thursday June 25: 35 min Run Breckinridge 4 miles run. Saturday June 27: 2:55 bike with Terry - Lake Lavon, McKinney Airport. 50.2 miles Bike. Sunday June 28: Bike: 8x1 at Breckenridge Park; HR Max 172; Ave 16.5, ride time 1:19; 21.8 miles ride. I had been hoping for a better 800 this week, but it did not happen. I accidentally stopped my watch during my run on Wednesday - so that time was inderterminate. Saturday was a soccer tournament - Five games between Marissa and Logan. Plus Reagan had a game too. I got up at 4:00am and managed to get 67 very slow minutes in. Sunday I flew to London. I had been hoping to run before my 6am flight but that did not happen. So instead I ran at Midnight (technically monday) once I get to my hotel in Chelsea. Nothing like a nice Midnight run on Thames!! Tuesday June 16: All Comers Track #5 800 Meters 5.25 miles run. Saturday June 20: 67 min run; 7.5 miles run.